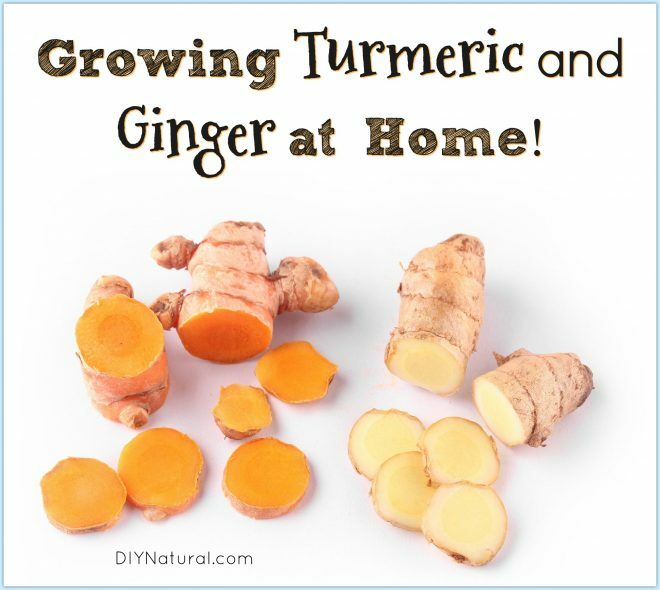 Growing Turmeric and Growing Ginger: Growing Healthy Roots at Home! I have to admit, if you tell me I can’t do something, I’m going to find a way to do it anyway! When I moved to North Carolina, people said I couldn’t grow tropical plants here. Thirteen years later I have a tangerine and calamondin plant, bananas and figs, and ginger and turmeric. Ginger and turmeric are easy to grow and you can have your own constant supply of these beneficial herbal roots. Ginger and turmeric are rhizomes, not roots, but roots will grow from them. Like irises, they like to sit on top of the ground or just below the surface. Look for fresh rhizomes in the organic section of your local health food store. These will not have chemicals which could inhibit rooting. Be sure the rhizome is plump, not shriveled. Look for leaves or roots starting, similar to what you would see on a potato. Take them home and store in a jar in the refrigerator for a few days. Mist with a bit of water to keep damp, but not wet. Mold will form if they get too wet. Once you have fresh rhizomes in your refrigerator, it’s time to prepare your pots. Even though the rhizome sits on or near the surface of the soil, the roots will extend deep into the pot. Be sure to choose a good pot to start, like a gallon size. Mix a good blend of dirt. My “special mix” is ⅓ existing soil or organic potting soil, ⅓ pine bark mulch (I used old applewood mulch last year with great results), and ⅓ compost or manure. If using manure, be sure it’s well aged. You can also throw in a handful of slow release fertilizer. Mix the soil well and water before adding to the pot. In the bottom of the pot, add about 3-4 inches of soil. Dampen again and add soil to 3 inches below the top of the pot. Place your rhizome on the soil and lightly cover. Water once more and place in a sunny spot. You can place them outside if the nighttime temperatures are above 50°F. If not, then place in a sunny window. Light is not key now – heat is most important in the beginning. This planting method will work well with both turmeric and ginger. You can plant both turmeric and ginger in the ground, but if you live in an area with bad soil, it must be amended first. I suggest the above mixture for in-ground gardens too. As stated above, wait until the nighttime temps are above 50°F before planting in the ground. Use the above instructions to plant the rhizomes in the same way. Keep well watered until established. NOTE: Be aware that both ginger and turmeric can be invasive if grown in the ground. Keep an eye on your plants, and if it starts to creep outside of the garden boundaries, place a shovel where you want to stop the growth and stomp on it! These rhizomes can be very tough, so it may take some work. Anything outside the boundary line can be used or replanted. Both turmeric and ginger are tropical, heat loving plants. Some years it takes until July for turmeric to put out leaves, so don’t give up on it too soon. Ginger will grow faster, and by summer’s end, it could reach 8 feet tall with numerous white fragrant blossoms. It will take a few years for the plants to reach a size from which you can harvest rhizomes on a regular basis, but it will be worth the wait. Keep in a warm place for best results. Sometimes ginger or turmeric can go bad when done this way, so you need to keep an eye on the water. If it gets cloudy or smells foul, change it. If you think the ginger or turmeric has gone bad, throw it out and start over. You can keep ginger and turmeric in water for years. If you place the bucket outside, watch for algae growth, as this can inhibit sprouting as well. When the first shoots are coming up, these can be harvested and used just like the rhizome. Ginger scapes are milder in flavor, but still spicy enough to add a treat to your cooking. Turmeric scapes can be broken off and added to milk with other spices to make “golden milk” and used in other middle eastern dishes. When young, they taste more earthy than spicy. In the fall when the nighttime temperatures dip below 50°F, both of these plants will lose their leaves and prepare to go dormant for winter. Dig up or bring the plants inside and store in a cooler spot, like a basement or garage. When you dig them up be careful of the fibrous roots that will be below the rhizome. Water a bit about once a month to keep the rhizome from drying out. If you live in an area that is higher that Zone 7, you may be able to get them to over winter outside. Two years in a row, the winter temperatures here did not get below freezing and both my turmeric and ginger survived. The next winter we had temps of 13°F, and they didn’t make it. Lesson learned. Have you tried growing ginger or growing turmeric? Give it a try this year! You talk about growing them in water. I’m doing aquaponics & am wondering if I could grow them in my tower system in the greenhouse. I’m concerned that from what you said, the root system will take over the towers & ruin my other vegetables & herbs. Do you have any knowledge relating to this? Good question, Debbie. I think you might be right about that. Tower gardens are great, but work best with shorter root systems. The roots from both turmeric and ginger will get pretty extensive. I made the mistake of putting my ginger into the ground one year. It was near a creek that kept the ground moist. I had to cut the roots off after digging back over 5 feet! I’m still not sure how deep they went. Do you have a source for finding turmeric root? None of our local stores carry it. Hi Rebecca! If you can’t find it locally, Amazon and Ebay both have fresh turmeric root.